Advance Ticket $65/person $100 per couple. Ticket price at the door $75/person. $1000 donation - 10 tickets, reserved seating at concrete table, special acknoledgement in the event program and signage on the table and permission to place promotional literature. Note: Additional tickets requested by one of the table sponsors are available for $65/person. 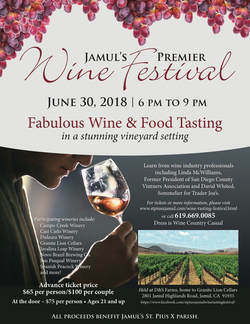 Advance ticket price of $65 per person or $100 per couple includes tastings from all participating wineries, a variety of sumptuous appetizer stations, music, opportunity drawings and learn from wine industry professional speakers. Ticket price at the door will be $75 per person. Limited Advanced Group Ticket Sales are available. A Designated Driver admission of $25 is also offered. Ages 21 and up. We look forward to seeing you at the celebration of our Wine Tasting Festival. * Ages 21 and up. The proceeds will benefit Jamul's St. Pius X Parish. For further information call (619) 669-0085 or in an emergency call (619) 665-6694. We would like to acknowledge with extreme gratitude our sponsors for the St. Pius X Community Wine - Tasting Festival. Without the generosity of these sponsors, our event would not be possible. Read about our 2017 Wine Festival in East County Magazine!